I went out on a mountain bike ride today; down the old North Shore Trail. Before the fires of 2003 and 2007, and the floods of 2003, the trail use to be one of those amazing places that was almost right out the back door. There were bracken ferns and wild tea rose lining the trails. In the lower portion, Bear Creek meandered along through a lush canyon filled with wild iris and tiger lily. At the bottom, as the canyon opened up, there were tangles of blackberry bushes hidden amongst the grasses. I remember when my wife first learned she had skin cancer. I went on that trail to clear my head and ended up getting dehydrated because I dumped both of my water bottles in order to fill them with plump berries for Tami; Probably 2 pounds worth! Flash forward a couple of hours. I found myself walking with Tami through another burn area; this time over in Running Springs. We were enjoying the daffodil gardens, which has been devastated twice in the last 5 years by fire (in 03' it destroyed the owner's home). Despite the fires, the gardens were cleared and ready to welcome visitors. For tourists, it's a chance to see a quaint local landmark. For us locals, it's a chance to see color instead of the dead browns, blacks, and tans we've become accustomed to. So, here's the photo of the day. Tulips against a blue mountain sky taken in Running Springs. I tried water coloring a print of Zion National Park. Not sure of I like the result, but it was fun attempting it. Pushing boundaries in anything you do is a good thing. Whether it's fitness, art, or your beliefs, it pays to get outside of the comfort zone now and again. Sometimes we get stuck in our little circles. Imagine a page of polka dots with none touching the other. Now, imagine if all those polka-dots expanded. There would be overlap, communication, understanding, creativity, & appreciation. Soooooooo, that's the mantra for the week; stretch your boundaries because once stretched, they never regain their original dimensions. On Rim of the World Highway, there's a huge old sugar pine that has been topped by lightning/wind/fire. It sit's below Strawberry Peak and is local landmark for locals and 'flat landers' alike. I like the tree because it has an almost bonsai feel to it and it clings to a fairly steep drop off. It just feels like the essence of preseverance and stability because the Old Fire burnt everything around it, but could not manage to burn this tree. I'm sure I'll re-visit this subject, but for now, it was printed on Stonehenge watercolor paper with akua brown oxide ink. Carved from a 6x8 blocl of linoleum. There's Gold in Then Thar Hills! Mountain biking is a passion. It keeps me fit, reduces stress, and give me some great folks to 'break bread' with and share in camaraderie. But the best part is when you get to pedal through amazing vistas. Today, we went down to Bonelli Regional Park in San Dimas, CA. The Santa Ana winds were howling. Several 18 wheelers were tipped over on the freeway it was so bad. But, about 5 miles from the park, it was like someone flipped the off switch and the winds just died. There was even a hint of coastal humidity in the air. 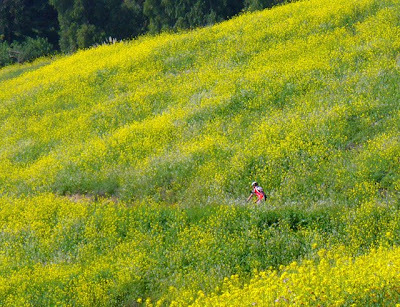 The backside of the ride was absolutely packed with wildflowers. You could smell just a hint of sweetness mixed in with with earthy tones. It was pretty spectacular. I almost forgot we were in a regional park with nearly 5,000,000 people within a half an hour of us. One of the biking moments to remember!